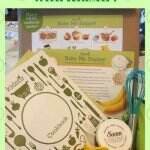 We got our August Citrus Lane box this week. Right now, I have them targeted toward my 2 1/2 year old son. While I normally really like the Citrus Lane boxes, I wasn’t super impressed with this box. Petit Collage Alphabet Flash Cards were probably the thing I like best in the box. I got the animal theme and they are super-cute. I just have oodles of flash cards already! Green Toys Tea for Two set. This blue and green tea set is made of eco-friendly materials and is food and dishwasher safe. Even though this box was for my 2 year old son, it was my 4 year old daughter who was most interested in this. 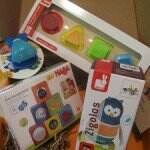 Reusable Cool it Buddy ice pack from Me4Kidz. These are cute, but I’ve already gotten a few of these reusable ice packs. Maybe I can use them as replacement ice packs when the ones in my bottle cooler go bad. As I said before, I normally really like the Citrus Lane Boxes. You can use code TAKETEN to get $10 off your first box!